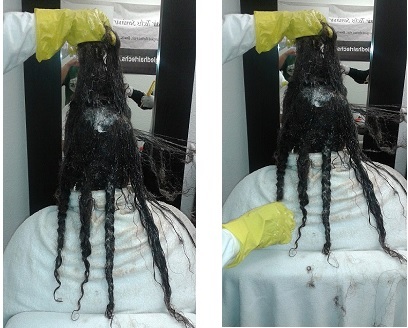 Determined to Detangle Matted hair...Desiring Detangle Services... Yet Tangled in Doubt! 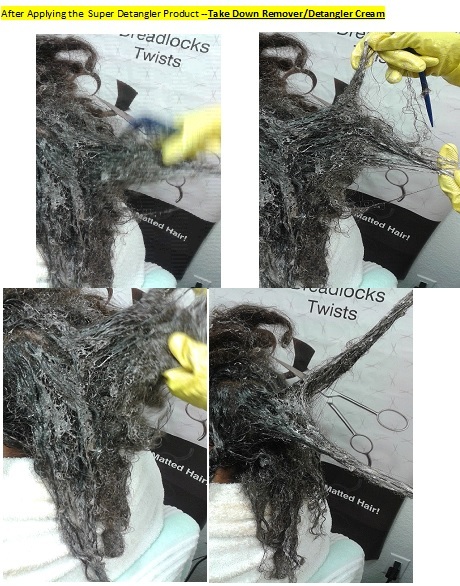 Our desire at Tangled Hair Techs International is simply to dissolve doubt concerning detangling very matted tangled hair. The story of Daniel in the Bible reveals that God can give wisdom and knowledge to solve any problem if we sincerely desire it. Daniel 5:16 proves to us that we all can receive wisdom from God to help solve or interpret difficult, knotty, tangled problems. Thank you so much for your quick response. I attempted to do it myself and was able to work my way through it and untangle all of it. If it wasn't for your video and encouragement I would have not even tried. I didn't even have that much hair loss. God bless you all. Thank you. I will stay anonymous for this subject since its not something in proud of. I'm a mixed woman of 35 years old living in Canada. 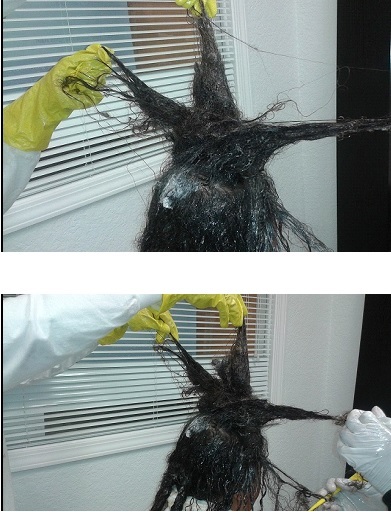 I always took extra good care of my beautiful long thick hair. Always using natural stuff and essential oils. People always complimented me for my beautiful hairs. This winter I've been through alot and I just crashed! During my vegetable period I did what is a big no no : Washing my hair, not brushing them or nothing and just went back straight to bed with my wet hair. I wasn't taking care of myself for about a month so I was just tight my hair up and it was a done deal. When I realized I had to cut them because it was impossible to detangle( and my scalp is extra sensitive due to eczema)... I couldn't find any solutions and I was so ashamed I didn't want to tell nobody.There's no words to describe how pissed off at myself I was and I felt as pretty as any crackheads you see on the streets! I'm not exaggerating. So i went on YouTube look for suggestions and i found you. So finally I decided to attack my hair pain and tears or not. 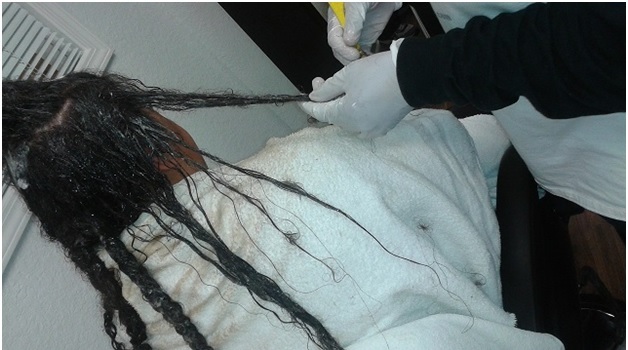 It was soooooo painful I started to drink a bottle of vodka just to be able to keep detangling. My hair were sooo dry it was like straw. I could get them from the floor make a ball with them and only the cat thought it was super cool! I've gained 50 pounds so cutting my hair was like I'd choose to gain an extra 100 pounds. I cried so many nights! Finally I found a website were I could buy it and the shipping was in the normal standards so I ordered one bottle since that's all I could afford. It arrived and I've used half the bottle put a plastic cap on my head and went to bed. 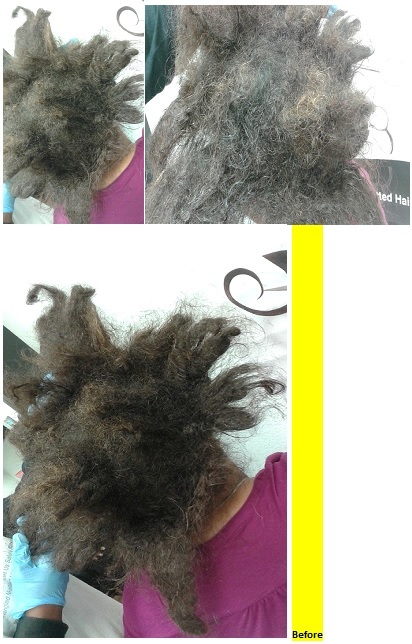 Woke up next day started detangling one hair at a time..taking guess since I can't see the back of my head.. Arms up... Got tired put back on the plastic cap and did this routine for 3days. YOU PROBABLY SAVED MY LIFE! I just had to get some intense hydration mask on and on. Proteins. And get my ends cut. It is important for me to take this take to say THANK YOU SO SO SO MUCH! The only thing is.. Maybe you should consider selling it in Canada.. Because at that price in u.s. Money...its not cool for us. The pric of the bottle is great is the shipping the issue. And I don't understand why I couldn't find it in black beauty stores. One again thanks indefinitely! I felt so bad,so much like crap, looking like it with my hair... Everything was going down and I had suicidal thoughts! Unbelievable how important the hair is a huge element of our self confidence,identity and in my case... LIFE! God bless you and be proud of being able to help desperate and depressed women! I've had Severely matted hair nearly 3 yrs. 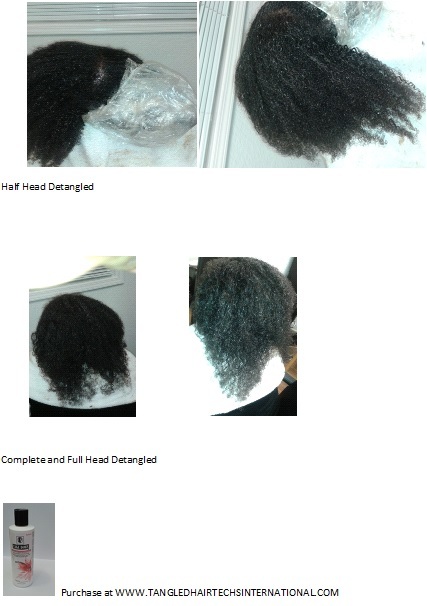 It started w/a broken wrist and it had mild matting that quickly progressed after washing it, going to bed w/it wet and covering it with wigs without detangling first to look presentable at work. I worked fast food at acTexmex restaurant. It quickly matted up badly & nothing I tried worked at unmatting it! I tried conditioners, mixed them w/glycerin, curl activator gel, everything; you name it! Nothing worked! It got worse, so I eventually quit taking my wig off & would leave it on up to 2 wks because it was so hard and time consuming to take on and off. 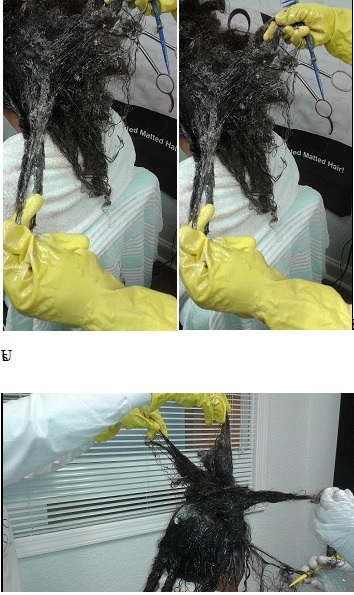 Eventually my scalp started smelling from the build up, but rinsing it w/diluted shampoo/conditioner kept it matted to the scalp in huge bird nest like masses! It started off in 4 braids, top 2 from mid part to just under ears, then other 2 in back bottom portion; Now it is literally 1 solid mass that I cannot get apart! I ordered 1 bottle of Take Down Remover Cream; it loosened from my scalp, but I didn't have time to get it apart because of my work schedule, and because it is too far gone & difficult to tackle myself, and I would Never let anyone else see it, much less try to do anything to it! It is so Embarrassing!! I am black by the way w/ a 4a/4b curl pattern. I am Desperate to get my hair apart so I can have a normal life again; as this is Severely Depressing & Embarrassing for me and physically damaging as well. The tension is pulling on my roots and I'm terrified I will have severe hair loss & stunted growth from years of having my scalp covered under wigs! It is physically painful, I have neck pain & headaches from caring all this extra weight from embedded dirt and grime that I can't get out of my severely matted hair! It has become unbearable and even has affected me on a former job. It was brought to my attention that it smelled like I had been working out even after rinsing it. I was mortified as this has never happened in my life! 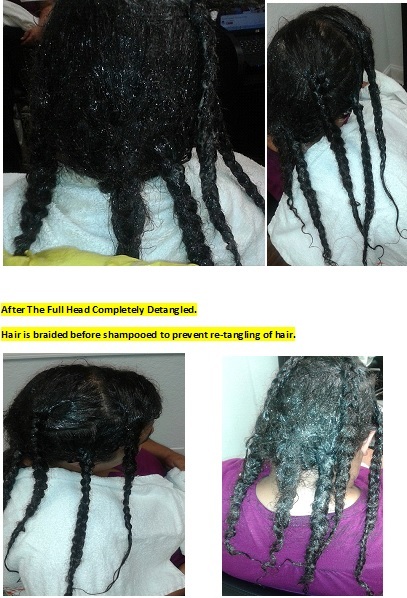 ( I used to love cleansing my hair & did so weakly prior to this). 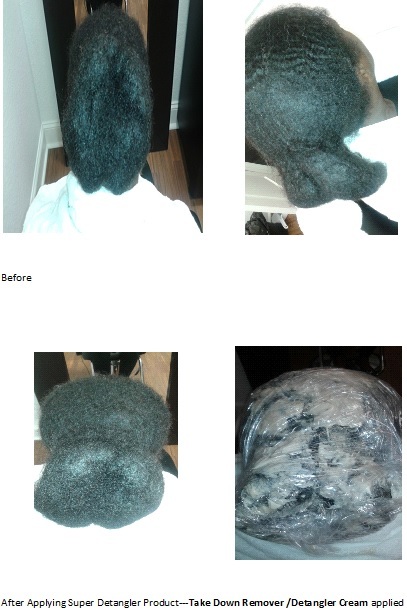 Now I only rinse it once a month because it is so matted and hard to recover w/my wig. And I can only wear curly or wavy big hair because my real hair is so big underneath, it pushes my hair up to 2" off my scalp in the back and looks ridiculous no matter how hard I try to pack it down! It is Very Embarrassing & I have even felt suicidal at times because of the embarrassing current state of my hair, the frustration of Not being able to do anything about it due mainly to financial reasons, Not having access to anyone who could help me w/out judging and criticizing me, and my resistance to lose my length or hair; it used to be armpit length when straightened. And I have a long, thin face and prominent forehead which doesn't look attractive w/short hair, so cutting was never really an option for me, and the thought that I might have to cut it all off is Very Disturbing & Emotionally Painful!! I feel trapped and have virtually No self esteem left! Everyone just thinks I should cut it all off & start over, since I wear wigs everyday anyway. They say no one will know, but I will, and hate the idea of seeing myself w/ short hair! I would rather have longer damaged hair that I can get braided every other month and trimmed until it is even & healthy and wear a sew in until my real hair is as long and healthy as I want! And I would like the option of actually occasionally being able to wear my real hair out occasionally w/out it being short, and making me feel Unattractive & Masculine like! Some may view that as old, suppressive thinking, and I'm not saying I don't agree w/that choice for other women; but Not for Me! I want my real shoulder length hair back! Please help! I can't afford to have it professionally detangled; though it Needs to be, and want to know if there are any financing options available for the working poor! Please help Me! I have been very depressed fro 10 yrs and battling damages from transvaginal MESH, AND being ripped off ny my lawyer on my Mesh lawsuit! They were a total waste of my money and time, leading me on for nothing! anyway, here in Fallbrook CA it gets to 106 degrees inside my house and it is so miserable when I had hair down to my rear as a former belly dancer. So I would just make a long tight twist and tack it up on the back of my head sorta like a french twist. At night I couldn't ever sleep because of the MESH pain down my throbbing legs and I would flip from one side to the other all night long in my sweat. I would just flig my long hair side to side and mats started on the back pf my neck. So trying to stop that from continuing I just use haor pins to tact the big french twist down, because i was tored of getting tangled in my long hair at night as I wrestled in pain flipping back & forth. NOW that goant twist has just locked down tight! Now I can't lay on my back as it's like having a giant hard hair pillow/ or hair helmet i tell my husband. 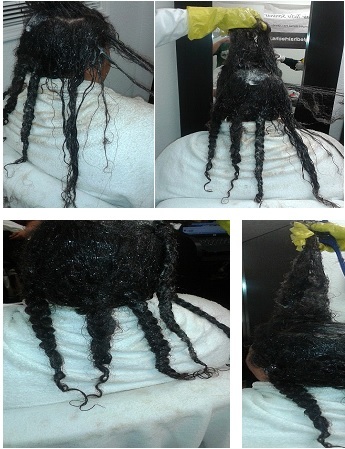 He was always cruel to me keeping me so upset 24/7 too so he just ignored my request that he help me UN-DO this hair rt from the start…therefore I just became more of a recluse never going out even, uless I wrap up my head like a Talibanner! Now it's in the 100 degrees again and no one to help. 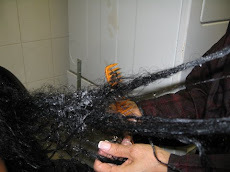 I bought small stainless steel knitting needles to use as pryBars, but still no one to help save any of this long hair. I am afraid that if a doctor saw this they might call the health department, as I look like a homeless person now, and am getting styles in my eyes a lot now too. Its strange how the matting is reaching forward on the top of my head too, it itches ans I can scrape dead skin under it with my finger nails. Next worry that with so much dead skin that the faint smell of that getting wet with seat might attract flies and then my fear is maggots! This is a complete NIGHTMARE! I am totally unrecognizable to the belly damcer that even did some modeling before. Because I fear the dead skin smell I do soap it up heavily with DAWN dish soap to cut the grease and then regular shampoo and a good conditioner…but the drying such a lump is even another nightmare that smells strange too. So is there any help you could do for me and my ever hardening hair helmet? It is so extremely aggravating to me that I am ready to go like the gilr starring in "V for Vendetta" But then the wig scene would be so blazing hot in the town too, AND I know causes matts in itself. I appreciate some help ASAP.